MS Days 2008 in Bulgaria is in history now and I could say I had a nice two days. There were many lecturers (about 50) and 72 sessions in 6 tracks. I covered also VB9 Literals. At the moment I started talking about VB I was thinking people would throw rocks at me (and some really considered that option:) ). But at the moment when repeated some of demos with VB9 code the audience was very impressed and they forgot about those rocks in their pockets. Even there were initial brainstorming whether same things can be implemented in C# with custom code. (Unfortunately this is a compiler feature and we cannot do it very easily). Another thing I mentioned was LINQ to XSD. Richness of new error pages and generated trace file - it is whole HTML+JS application built with XML & XSLT with incredible amount of information. WCAT stress test with view of live requests on the server. Analyze server and site load using IIS7 Admin Pack features. I have been presenting IIS (Internet Information Services) for a while and there is one slide in my deck which says that there is No critical security patch since RTM for IIS6. Recently there was some news about 500k web pages was exploited with SQL Injection hack(more info here and here). Although this could put some shadow on IIS security it has to be clear that this is not an IIS exploit. This is application exploit. Any application could suffer SQL Injection (video: Length: 6:01 - Size: 6.37 MB ). It is not like uploading harmful file on the server and execute it, isn't it? Because if you get as password the following string ' OR 1=1 '; drop table Users; you will drop the table from DB and apparently the application will stop working. Stored procedures are very powerful and they have many benefits than using UDF (user defined function). There is one cons though - resultset cannot be manipulated further from T-SQL. How much of success is the technical side? All of us has heard of software companies that achieved a great success - Microsoft, Apple, Yahoo.. more recently Google and Skype. As we are technical people we tend to think it is related entirely with some super-duppa algorithm, smart software or you name it... built even in a garage. In most cases this is the initial power that make them move. But after initial start there are another factors that counts. Have you wondered how is possible to build world class product with team of 5 and within a year to have a team of 100 (or 1000) doing same thing? This is very dangerous situation because there is a moment in a young company when nobody knows what exactly are their responsibilities. It is dangerous because clients starts to suffer low quality of service. Having many teams require a lot of communication and not knowing how to structure it a lot of precious time is wasted. Such situations requires a good leadership. Even in such technical lines as engineering, about 15% of one's financial success is due one's technical knowledge and about 85% is due to skill in human engineering, to personality and the ability to lead people. Software industry is very different to other well known industries and in same same time very similar. Leadership is very same. Employees are not told what to do anymore. Now, you influence their choices and assist them in reaching their goals. You do not direct; you win the team over to your point of view. You do not dictate; you inspire! You can learn how to convey this inspiration by focusing on your leadership skills development. Leadership development is needed to successfully take charge of your team in today's business world. 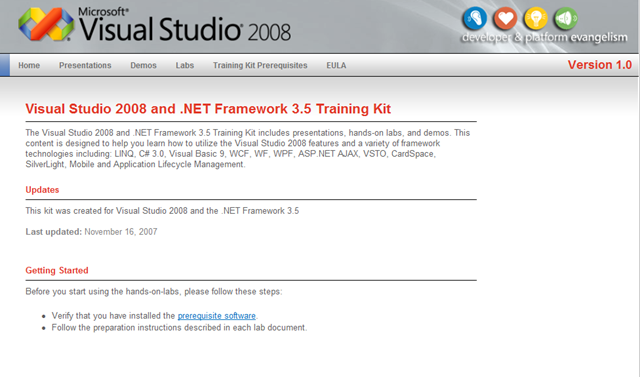 Note: For this release of Visual Studio there are so many materials and training kits as never before! All one have to do it download and read, play and practice. And this is because of the strong community and internal support by Microsoft teams. It's settled! The Entity Framework (and the Entity Designer) along with ADO.NET Data Services will RTM as part of the Visual Studio 2008 and .NET 3.5 SP1 releases! Unfortunately, we don't have official release dates at this point, but stay tuned. You'll also want to keep an eye out for the upcoming SP1 Beta 1, which will be your next chance to check out updated bits for both of these products. 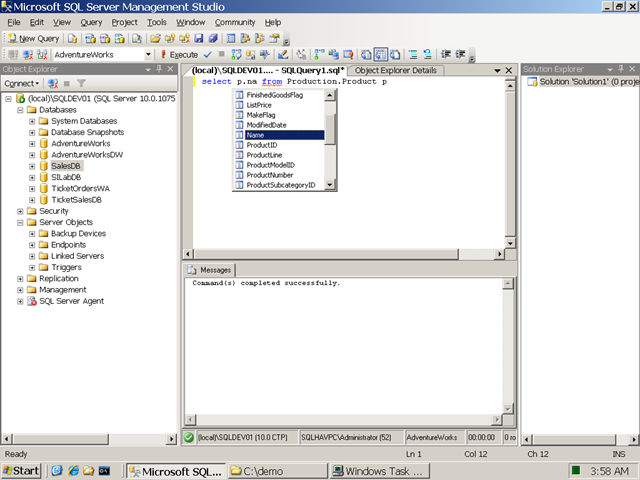 I've been working with SQL Management Studio since it's release (and even before) and I think it is a very good tool. Especially as in next version there will be IntelliSense. This is not the case with windows authentication. 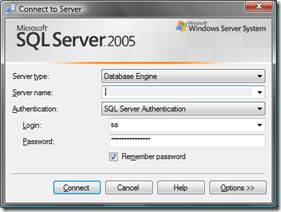 Especially in domain environment it is better to give access to domain groups and users instead of creating SQL ones. As a workaround (the one I've used 'till today) you can do remote desktop connection to the server and do the job via RDC console. I have struggled with this approach for a long time and although it is not that bad there are some issues working all the time via RDC. 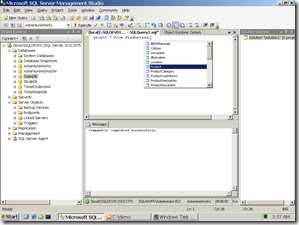 C:\>runas /netonly /user:domainName\userName "C:\Program Files\Microsoft SQL Server\90\Tools\Binn\VSShell\Common7\IDE\ssmsee.exe"
IntelliSense in MS SQL Server Management Studio! Finally!!! 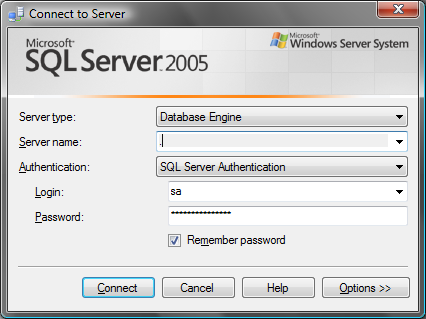 In the new MS SQL Server 2008 (a.k.a. 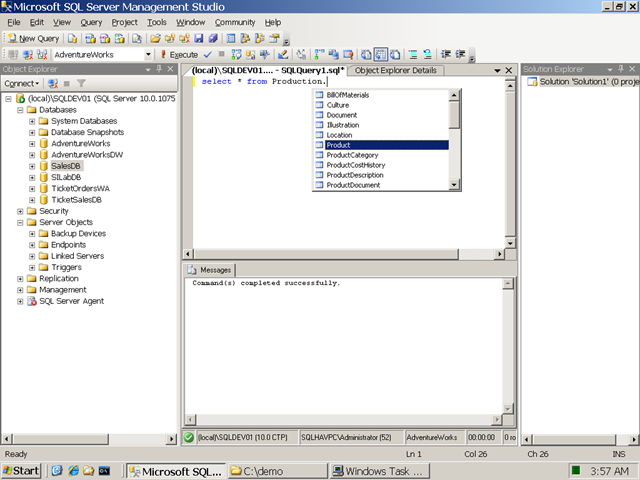 Katmai) Management studio will have IntelliSense. It is not very stable and performance is not great in CTP6 but there is still time to release to make it as good as in Visual Studio. 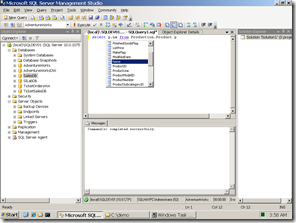 I found an interesting article on CodeProject: How to crash MS C# Compiler!. These are interesting issues. I am not a compiler guy (meaning I do not write compilers) but still it is interesting. Who needs to write such statements! ?